Pippa looked beautiful! Her wedding gown was stunning! I hope Pippa’s dress influences designers to put sleeves back on wedding gowns. I’ve never been crazy about strapless wedding dresses and only a few select brides actually look good in them. I took your advice and posted on the other thread how to make a heart. @sheba2011 I know how to make the heart! ♥. I tried to put this on your thread but it got lost. Here’s how. Push on the “Alt” key. Then using the side numeric keyboard (not the top numbers on your computer push “3” simultaneously. Release and heart shows up. It’s tiny I know but something! I don’t know if this is the place. I hope your father is doing well and you too. sheebs, as usual your pics are sooo incredibly awesome!!! the detail of pippa’s dress totally came alive. just love them. also, thanks so much for asking about my dad. you are so sweet. his wounds are healing. i left a little note on the hd thread. i love you sheebs!!! it’s too bad we did not get to go to pippa’s wedding. my understanding is that even prince harry’s girlfriend, american actress meghan markle got taken to the reception. go figure. we all should have been in movies…. 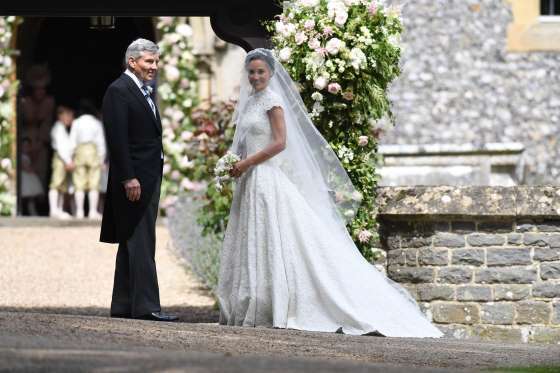 PIPPA looked ABSOLUTELY STUNNING in her lace and silk wedding dress designed by british fashion designer Giles Deacon. I loved everything about it, especially the back detail. soooo gorgeous!!! I also thought her flower bouquet and the rest of the flower arrangements for the wedding were beautiful as well. everything was in fabulous taste and in the spirit of true fresh, clean and classic elegance. and, many congrats and blessings to the entire middleton and matthews families. according to accredited news sources, it is being said that pippa’s “something old”*** are her earrings!!! for her big day, pippa has chosen to wear the same pair of earrings that she wore to her sister’s, princess kate’s wedding six years ago in 2011.
pippa’s earrings are custom made pear-cut diamond drop earrings that her parents commissioned specifically for pippa from the elite London jewelry boutique of Robinson Pelham back in 2011 when pippa wore them for the first time to her sister kate’s wedding to Prince William. in addition to her “something old” earrings, pippa also wore her antique Asscher cut engagement ring- again purchased from English jeweler Pelham — and an understated gold band made from the british traditional welsh gold. 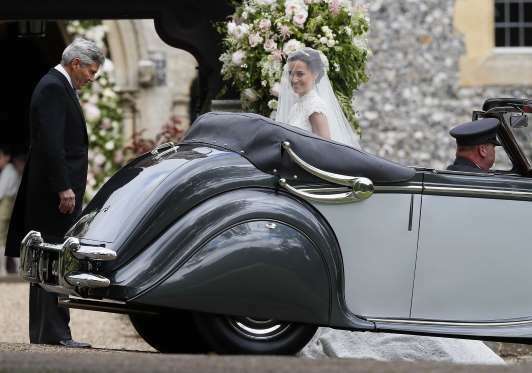 HOWEVER, NOT TO DETRACT FROM PIPPA, PRINCESS KATE DID FOLLOW THE WEDDING DAY RHYME IN FULL ON HER BIG DAY BACK IN 2011!!! PRINCESS KATE’S “SOMETHING NEW” WAS ALSO A PAIR of custom-made diamond earrings given to her as a gift by her parents on her big wedding day. similarly to pippa’s, her parents again commissioned the earrings from the elite London jewelry boutique of Robinson Pelham. however, the design of kate’s earrings differed from pippa’s in that on kate’s pair of earrings the family had chosen to design an acorn and an oak leaf on them to represent the family coat of arms and they were created to specifically echo and complement the tiara that she borrowed from the Queen. in detail, the earrings were diamond-set designed oak leaves with a pear-shaped diamond set drop and a pave set diamond acorn suspended in the center. NOW, FOR THE BIG REVEAL, DID KATE HAVE A LUCKY SILVER SIXPENCE IN HER SHOE??? the answer is, YES, SHE DID!!! “something old, something new, something borrowed and something blue and a sixpence in her shoe…” on her wedding day. and, “a sixpence in your shoe” is namely a british custom which is a wish for good fortune and prosperity. here’s a hearty cheer to love, loves. @josephinea thank you for all the details on what Pippa wore. I am in awe of that lace dress. It is fitted to perfection on her. backside stole the limelight from sister Kate’s dress. The press went wild…..lol Yes, two lovely women and wish them the best of luck. Kate did a great job handling the children just like Pippa did at her wedding.